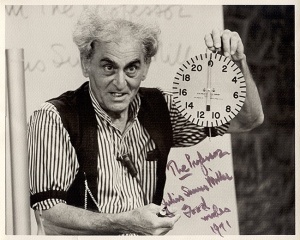 Demonstrations in Physics was an educational science series produced in Australia by ABC Television in 1969. The series was hosted by American scientist Julius Sumner Miller, who demonstrated experiments involving various disciplines in the world of physics. The series was also released in the United States under the title Science Demonstrations. This program was a series of 45 shows (approximately 15 minutes each) on various topics in physics, organized into 3 units: Mechanics; Heat and Temperature / Toys; and Waves and Sound / Electricity and Magnetism. CosmoLearning is promoting these materials solely for nonprofit educational purposes, and to recognize contributions made by Julius Sumner Miller (Prof. Miller) to online education. We do not host or upload any copyrighted materials, including videos hosted on video websites like YouTube*, unless with explicit permission from the author(s). All intellectual property rights are reserved to Prof. Miller and involved parties. CosmoLearning is not endorsed by Prof. Miller, and we are not affiliated with them, unless otherwise specified. Any questions, claims or concerns regarding this content should be directed to their creator(s).